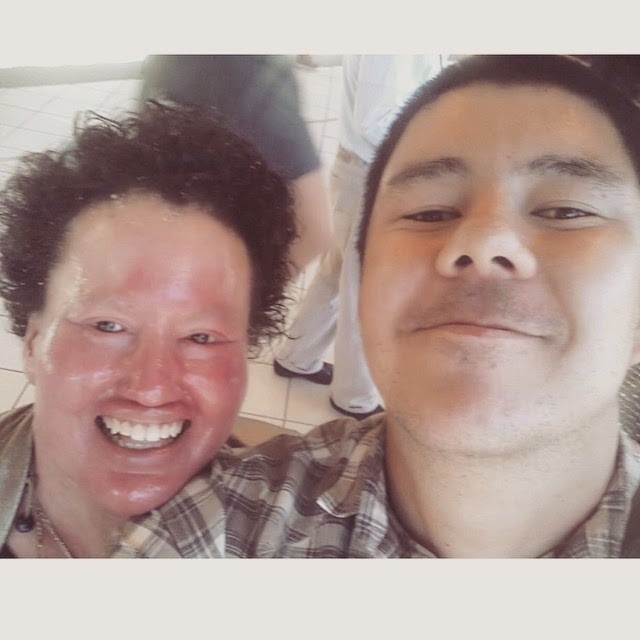 Since being with Adam, I’ve come to see what it means when someone truly embraces my skin condition and my appearance. He doesn’t look past or love me in spite of the way I look. He doesn’t accept or tolerate – those terms are condescending and suggest someone has to accommodate a disability. He loves me. He loves all of me, and all that I leave behind. Adam calls me his flaky strudel. He once told me that he finds pieces of my skin in his pockets, allowing him to carry me with him. He looks at me adoringly, with whatever face I’ve got on. In the morning, his beautiful face beams at my just woken up face – taut with yesterday’s skin. I’m feeling my least beautiful and he looks at me like I’m a supermodel. When my new face is on and I’m feeling good about myself, he’ll say, “you’ve got something on your face. It’s beautiful.” And my heart melts. Every time. I was reading a blog post by a blogger called Mom of 4 is Tired on the weekend. I immediately sent this passage to Adam, saying that the blogger could have written this about our relationship. “Who is telling you that your body isn’t the ideal? Only people who don’t really matter. Only people you don’t know. Only that same voice in your ear that is telling you you ‘re not a good enough mom or worthy of a raise or shouldn’t go back to school or wear that dress. Are they invested in you? Are they worth believing? Who is telling me, telling you that your body is exactly right? This passage resonated with me so much. A year and a half ago, I’d have resigned myself to a life of singledom, that I’d never experience this true love. Now, I am so lucky. Adam wants to touch me when I feel least desirable. He looks at me in wonder – no matter how I look. He holds my hand proudly, wherever we are. He’s never made me feel like I have to apologise for being me. What a privilege that is – though it should be the norm. I don’t think happiness and the pinnacle of disability is finding a partner. And I say that even when I have – because I lived independently for so long. I developed the strength to love myself on my own, and I never thought I’d need a man to affirm my beauty. But the way Adam sees me is so powerful – for me, and for everyone who doesn’t see what he sees. We set our wedding date on the weekend – 20 March 2016 in Melbourne. Such a happy moment for us, and such a happy time we have to plan. Gosh I love him. awww…. that made me all 'motional, Carly! Such love is rare and special. My man loves me in sickness and in health too, you are right, it is a deeply powerful thing. I hope I can do him credit with the way I love him back. We are fortunate to have been able to recognise men such as these for the treasures they are. So many very special men are passed over by girls looking for some kind of weird ideal that will never make them happy. Look for kind men, that's what I say. Kindness takes any marriage further than any of the other attributes a partner might possess. And what exciting times preparing for your wedding! I can't wait to read all about it as it unfolds! Wow, what wonderful news, Carly, best wishes and congratulations. I so look forward to watching you plan and prepare for this most momentous occasion. Kindness is the most important characteristic I think; so many other qualities stem from kindness and compassion; we are blessed. I too have an ace for a hubby-thirty years and counting and I have been sick with CFIDS and chronic pain the entire time. He's a gem, like your Adam, loves me for who I am not what I look like. Best to you both as you plan your wondrous event. Beautifully said. So very happy for you both. G'day and WHOO HOO Carly!!! I am sooooooooooooooooooooooooooooo happy for you and Adam! What a great post and LOVE that you are sooooooooooooooooooooooooo inspirational to MANY!